Game three of 2000s Week features Tom Kavanaugh, Larissa Kelly, and Russ Schumacher. Who will advance to May’s quarterfinals? Check out my preview. Russ did find it, but made a weak wager (see below), putting him into contention but with a mind-games situation against Larissa rather than a “I’m gonna make you get it right” scenario. It’s just between Larissa and Russ, because Tom has less than the difference between the other two. Larissa should wager 8,001 to lock out Russ. Russ should wager no more than 600 to stay above Larissa should they both miss. 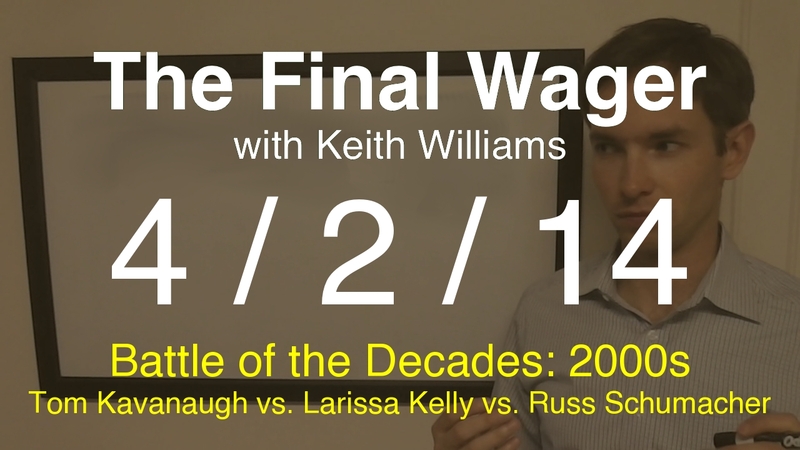 If Larissa thinks Russ will go small – which history suggests will happen – she should wager no more than 6,799. In response, Russ could wager everything to cover this – but Larissa’s history suggests she’s going to go big! And, yes, both did what we thought they might do, and both missed. Russ advances! Go Class of 2004! Now Russ wagers between 4,000 and 9,599 (preferably at most 5,599) and has a much better chance of winning. Just because you’re my friend doesn’t make you exempt from The Final Wager’s, um, wrath! Correct response: Who was Ivan the Terrible?